Maximum power to let you go further. The Baron G58 is a powerful twin engine with excellent range and luggage capacity, being one of the most comfortable in the category. It is no surprise that it is an absolute top seller, with more than 6,700 units produced and delivered worldwide. Whatever your mission, you can count on the Baron G58. The model has excellent range, it can operate on short and unpaved runways, and it perfectly meets the most diverse needs, whether for leisure or business travel. The Baron G58 optimizes its interior space like no other model in the category. Its cabin can carry up to six people. In addition, the aircraft has an external luggage compartment in the front, ensuring that passengers do not squabble over space for suitcases or luggage. In addition to being equipped with two excellent Continental IO-550-C engines, the Baron G58 has advanced features for perfect operation. Among the many highlights, we can point out the weather radar, which provides the pilot with key information for a safe flight. 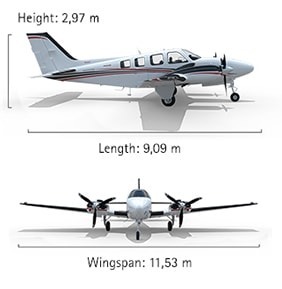 The Baron G58 retains the main characteristics of its Beechcraft manufacturer, and at the same time, incorporates the best developments of the evolving market. With an interior of generous proportions for the category, the Baron G58 comfortably fits up to six people.